I had the great pleasure of conducting my first interview with Mika Väyrynen in Ikaalinen, Finland on June 30, 2004. It was a very exciting weekend. 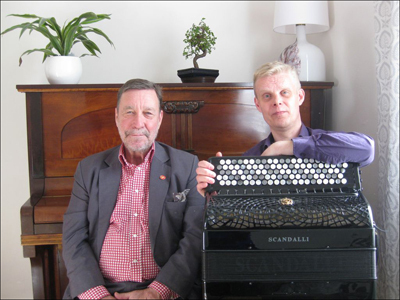 Mika was kind enough to coordinate and come with me to translate the Interview with Finland's grand name in the accordion, the late Lasse Pihlajamaa. After this wonderful and historical meeting, I interviewed Mika, taking Accordions Worldwide readers to another world of accordion in Finland and abroad. Now, almost 10 years later, we are happy to explore what has been happening with Mika's extraordinary career. Mika is undoubtedly one of the most outstanding accordion artists of the new Millennium. He has performed all over the world both solo and in concert with other internationally acclaimed artists and orchestras. 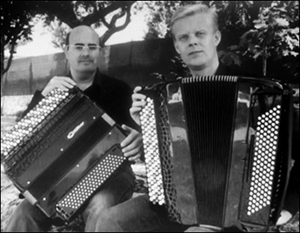 He has an impressive list of recordings and is responsible for commissioning many new works for accordion. For more information, you are invited to visit Mika's website. Here you will find his biography, information about recordings, World Premieres, pictures, sound clips and multi-media files and more. We also invite you to enjoy the article included in this Interview 'The Technical Strategies of Playing The Accordion". My sincere thanks to Mika for taking the time out of his busy schedule to do this second interview. You already have 19 CD's released, and now you are embarking on quite a big recording project to release a series of further CD's. Can you update us on this project. Actually I have more CDs. I was the guest artist in some projects for example with some vocalists, so while I have 19 released under my own name, I have actually recorded a few more. Since 2004 I would say both musically and privately things have been quite challenging. There was a period of about five years, that were quite difficult. But this time made me think and re-evaluate things. Not only in my private life, but also in my musical life, things changed quite a lot. My philosophy of my work, fundamentally didn’t change, but I started to ask myself questions like what? why? when? Who am I? Where am I going? Was the direction I was going in 'ok' and can I keep going like that? What do I want from my life? In 2009 my best friend died and it made me think very profoundly about the limitations of our time on this earth. It was a quiet period when I did a couple of recordings. I did what I had to do, but I was basically repeating internally what I had done for a long time. Finally it was time for a kind of ‘re-birth' after considering things. Still I’m not after fame, I’m not after artificial success, I’m not after external things, I’m actually more and more after internal things. These recording projects are more results of my thoughts. I wanted to play something as big as Goldberg Variations. I’ve done these types of projects several times but as I turn 46, I still want to challenge myself. I, in fact, wanted to find my real potential, my real potential as a musician. Many accordionists of my age, don’t believe anymore in the life long learning, but I have my motivation, and a plan of precisely what I’m going to do for the next five years, such as what pieces I’m going to play and what CDs I’m going to do. But the recordings are not done for the recordings themselves, they are more the testimony of things I want to do before I leave this earth. You never know when it happens, and we have a very limited time here, but everything I’ve done is just for me, just for myself, I don’t do it for anyone else. I don’t do it for the accordion industry leaders, I just do it for me. So, there are things to come. Now I do these CD’s, these two volumes of Bach and it took me years to consider what to play and I was lucky enough to find the CD label. 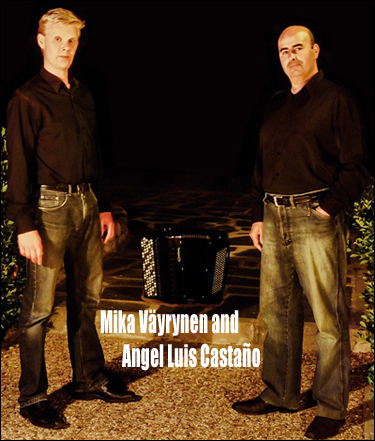 This 'For Duo' CD, with Angel Luis Castaño (Segovia, Spain) was dreamed of for years… Angel is one of my closest friends. He was even my best man when I got married in 2011, and now finally we were able to make the CD dream come true after recording in Spain over four days. The Bach Volume 2 is coming out, which I recorded in the beginning of May this year, and in June, I recorded with the Helsinki Philharmonic, the Concerto by Tüür and then later in the Autumn I will do the contemporary material recording, and then I have one project for next year, and then I plan to have a break until 2018, with no CD recordings in those 3 years. So this latest series of recordings includes 6 CDs. Works: Praeludium XXIV (BWV 869), French Suites No. 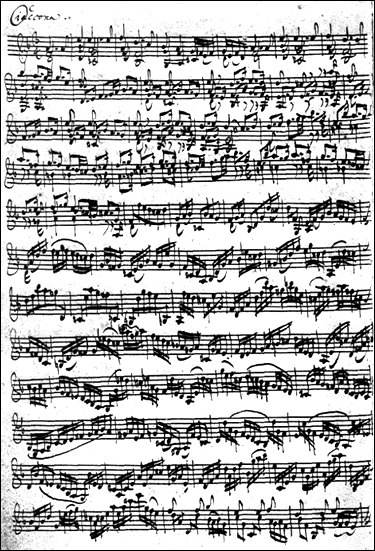 1 (BWV 812), No. 2 (BWV 813), No. 3 (BWV 814), Passacaglia & Fugue (BWV 582). You have recorded the Bach 'Chaconne' on your 2003 CD Transcriptions and again in 2006 on your recording "Tree of Life". How has your time with this magnificent piece evolved? It has been kind of a ‘lifetime’ project. I learned it.. I’m not sure even when, but it must have been at least 30 years ago and I was never really satisfied with the arrangement. I played an already existing arrangement for accordion. It was ok, but I was feeling a little bit ‘empty’ with this one, so I started to reconsider it, and my thoughts about arranging also changed. After the first recording, it was kind of an ‘item’ of what would come, and then I spent a year going part by part and trying to adapt it better for the accordion. I don’t know how much Bach-Busoni is left there, but when I recorded it the second time in 2006, this was the final version more or less. I was pretty proud when some pianists asked me about this arrangement and they even wanted to adapt it on piano, but it is impossible on piano because I used the technology of the accordion including the possibility to play the precise same voices in both hands (such as C1 and C1) and quite a lot of very accordionist techniques. I don ’t know if I will ever be really satisfied with it, but at least it is better now. I perform it every now and then. I performed it last summer, but it was quite a break since I performed it last time and now I plan to include it every now and then into the program. It's an excellent beginning piece for a concert, because I’m not afraid of it any more. Many people are, but if you have played it as many times as I have, then it's a little bit easier. But, never 'easy'. The more I played it, the more I realised how difficult this piece actually is. The difficulty might not be keyboard wise or playing technique, or the memory, but the total construction. The architecture is really demanding and the more one plays it, the more one sees more what the genius of that piece really is. But, this is just one piece in my pretty big repertoire. In 2004, you performed the complete Goldberg Variations, and last summer (2012) you presented a monumental 'all Bach' program. Can you tell us about the inspiration behind these incredible undertakings? There is no special inspiration. I don’t consider.. or I don’t see any special inspiration, as my life in general is one inspiration for me. To be honest, I just play for myself. I choose what I want to play. It was different when I was younger. I chose what I thought people wanted to hear but to me, as I mentioned when we spoke last time, it's all about learning. I can’t go and repeat all the things I can already do. I have to learn and the more demanding tasks one has to face, the more one learns, and to me, it's all about learning. I didn’t take certain demanding pieces into my repertoire to show that I can play them. I was really fascinated with the idea to learn these pieces. I’ve decided to live my life in a way where I don’t speak about pieces and I don’t dream about pieces, but instead, I would rather actually try to play them. I don’t know what the outcome will be, but I’m now 46 and without challenging myself in such ways, I wouldn’t learn. There are so many good musicians on this planet. There have been so many talented and good accordionists if I look back over the years, but there are not many left from my generation for example. Why? Simply because we get tired when we just repeat things we can already do. If we don’t raise new challenges, we don’t learn. The first 20 years is just learning the fundamental things of playing, the next 20, 30 and 40 years is to learn more and more fundamental things. This is how I think. I’m not a very commercial person, I just choose what I want to play, and if I do them well, somebody might enjoy listening. These Olympic style things are not the important aspect. There are so many people who have incredible memory and could play practically anything by heart, but these things are secondary. Things I do might sound like Olympic projects, but to me they are just what a musician should be able to do. What kind of preparation leads to a concert of this magnitude? Well, in reality there are no secrets.. there is no mysticism, it is just work. It's better you have practiced not only that particular piece, but ‘every’ aspect of playing, such as your technical things. Psychology doesn’t develop over night. It's different after 50 concerts and after 500 concerts. It’s a very long process. And then to learn about ones self. How do I react to certain impulses, it’s the biological things which happen when the pulse gets nervous etc.. There was a time when I used aggression before a concert when I was younger. I was angry and that kind of protected me of being afraid of black outs and mistakes etc.. but nowadays it's not that. It's just good preparation, good practice. More or less, I also start to believe my fingers as well, because they have played a very long time and they start to know where to go. Emptiness is very difficult to understand, and when one performs, like last summers all Bach concert by memory for example, one can not go to perform full of expectation, and to 'expect' something. One has to go there completely empty. I don’t want to play Bach, but I want Bach to play me, if you understand what I mean. No body can survive playing Bach. It's absolutely impossible. Those individuals who want to play Bach will always fail. But those individuals who want Bach to play them, have a chance to survive. And the word 'interpreter' is very important here. It's to ‘interpret’ the music and the way one believes it was supposed to be played, but when one starts to ‘interpret’ as in the different meaning of the word, then one will be lost. There are many players who are very afraid of playing Bach and playing polyphonic music. They approach it very egotistically... “I want to play Bach” but it's wrong. It should be.. “I want to give Bach a chance to play me” and then it’s a lot easier. Of course, Bach is extremely difficult. One can really get lost in that material. I have the ability to see a piece in a three dimensional way. I have spoken to some very talented people and it seems that all of us see things differently. I can see the big picture from very many directions simultaneously so the piece doesn’t exist in a horizontal or vertical form. It's not even as long in the mind, as it is in the length in minutes. It's very difficult to describe really but that is how my mind functions. It's how I see the pieces, it’s a certain kind of timelessness. If I think about a certain piece, I see it as a ‘continuum’. I see it all at once, all about it, from the first to the last note. Maybe it's my handicap, but it's something that has, in my life, made it quite easy to memorize things. I practically remember everything I have played, or I can return it to my memory in a very short time, whatever I have played. Some people see things in colors or with a photographic memory. I have some students who have incredible memories, but we see things differently. There are so many different sentiments that every individual feels, remembers. It doesn’t matter what the method is, but it is what comes out, that is important. I remember I learned the Goldberg Variations in 30 days, and by memory. It consists of 32 movements, but two of them are the same. From looking at the list of Premieres and the composers involved, it seems you have a great commitment to and connection with working with renowned names in the contemporary music world. This year you will work with commissioning new works from three composers including Paavo Korpijaakko, Veli Kujala and Pasi Lyytikäinen. How have some of these other projects come about? The build up to this project started several years ago. When commissioning new music I have sometimes felt that there is not a link to the history of music and when we get a new piece it is just a ‘new piece’. I always plan things. Now i have almost everything planned until 2018, most of the pieces I am going to play, most of the projects. For 2014, I decided to go Romantic and am doing something not very usual for me. I am turning Virtuoso for a while. However, I don’t want to play only transcriptions, so the approach for these three new pieces, will be that we will get three pieces that will remind one of romantic things. Each composer will use material from some existing Romantic works, and not necessarily as variations. The only criteria for these three composers is that they have to somehow include something that we know. Pasi Lyytikäinen, who really loves Italian food and music decided to include some things from Verdi. Korpijaakko's piece is done, and he has included something from Edward Grieg and titled his new composition 'Peer Gynt Fantasy.' Kujala will include some ideas from Liszt´s Mephisto Waltzes. I have tried combine Romanticism with completely new Romantic contemporary stuff, and a very virtuosic style. These pieces have to be difficult. I think something like this has never been done on accordion before, so I planned a complete program where these three new compositions will be mixed with Romantic piano tradition, so that is the next thing. Hopefully these new pieces will become hits among accordion players. When you listen for example to Yesterday by the Beatles… how do you understand it? Well, you don’t understand it, but you know it, and because you know it, it makes you feel like you understand it. The same with Contemporary music. If there would even be a tiny fragment of the National Anthem of the USA in a piece, people would recognize it and make the audience easier to approach. Knowing these three very skilful composers, they will hide it in a way that its not a ‘banner’ or ‘advertisement’ for the piece they have included, but it will be done in a very sophisticated way. I think we need such things. I am quite happy to have invented this project but it's something for me personally, and basically I just do things for me fundamentally, but at the same time, hopefully it might lead to something very productive, but they are not going to be easy.. really! Each of the commissions will be approximately 10 minutes each. In 2014, I plan to perform all of this program and record it. In addition to Korpijaakko's, Kujala's and Lyytikäinen's new pieces, I will doing some other works such as pieces by Grieg, Mendelssohn/Rachmaninov and Saint-Saëns/Horowitz. Composition: Sonata No. 7 - "Misterium"
As Chamber Musician and soloist, you have performed with an elite group of musicians and conductors. Have you had any interesting reactions from them in regards to the accordion and its sound/capabilities? Almost every time! You know, classical and contemporary accordionists sometimes think that everyone on the planet knows, or at least all the instrumentalists, what is possible with the accordion and what this instrument is about. In reality, it is not this way. Many times I have been the first accordionist to play with certain instrumentalists and the fact is, whether it's an instrumentalist or an orchestra or conductor that has never played with an accordionist, there is always this time to prove that we are somehow upper class. Those people also expect talent. So first of all the music has to be good and one has to play well. One has to kind of be, if not as intellectual or educated, at least as close to them as possible. Also, these great musicians are used to performing with other great musicians, so one can not have the ‘wow’ effect all the time. They are used to the big competition winners so again, one can’t always have the ‘wow’ effect, but one can survive, and one can manage and give a positive experience. Sometimes it can happen badly you know. For example, I was the first accordionist to play with one particular conductor, and so afterwards, the conductor was thinking that all the accordionists are like me. He, in one country, booked an accordionist to play a certain concerto and then he phoned me in the evening after the first rehearsal and asked 'what shall I do? ', because this person is absolutely not capable of doing it. The accordionist was saying that the piece was impossible etc… and so I was finally giving fingerings to the conductor by phone for those passages that the soloist could not play, and the piece was not even very difficult. Many of the people I have played with, have become my personal friends, and they don’t think of me as an accordionist, but as a fellow musician. But the destiny of the accordion life over the next 50 years or so, is to prove we are capable musicians, each and every time because there are so few people that really know about us, in the big picture, the really big picture. It seems that it is a never ending process. Mika is pictured right with world renowned Conductor Okku Kamu. Photo by Vilja Rydman. Probably it will end one day, but realistically, by then, we are no longer here anyhow. It depends where the accordion movement is going. You know, if we continue as is, accordionists know about accordionists already, so it's not the point to try and convince us as we know about it already within this small society. It’s the big society outside that doesn’t always know about it, and I think that has to be our focus. But you just can’t go in there, merely by wanting to go in there, one has to have the true quality that the big musical society requires.